The future is here with this 51 Leopard Catamaran by Nova Luxe producing a "0" Carbon Footprint with her electric Solar Powered motors and Unlimited Range. Let Global One Yacht Sales assist you in stepping into the next generation of Solar Powered Luxury Yachts. We are a worldwide dealer for the Nova Luxe Line. Drawing upon the success of previous Leopard powercats, this economically efficient catamaran uses less fuel than other power models and offers unlimited range on her Solar Power. She also incorporates a brilliant ergonomic layout that makes maneuvering around your yacht comfortable and easy. CLEARWATER, FL (October 2013) – Leopard Catamarans recently launched their all new, spacious, Leopard 51 Powercat (PC), built by Robertson and Caine and designed by Simonis Voogd Design. The newest member of the power fleet brings with it a multitude of exciting features: a new sleek and stable design, a large forward cockpit, additional lounging areas, an expansive flybridge and a completely redesigned interior upgraded with modern appliances. She also offers more stability than traditional power monohulls, as well as providing additional space and a greater value. Drawing upon the success of the Leopard 39 PC and Leopard 47 PC, this contemporary and economically efficient catamaran uses less fuel than previous models. With her solar power this yacht has unlimited range. Leopard team member Peter Wiersema explains, “The 2014 Leopard 51 PC is expected to revolutionize the world of power catamarans.” He also stated “the Leopard 51 Powercat has a stealth-like hull. The Leopard 51 Powercat, being a power catamaran, features magnificent stability, even in rough seas. Alexander Simonis, designer of the Leopard 51 Powercat, recently went out for a trial run on the new power catamaran in Table Bay during a severe winter storm with swells as high as 7 meters. Alexander Simonis felt these were “Ideal conditions to show the power and ability of the new Leopard.” He went on to say, “We headed out into the swell going full bore (20+ knots). The boat had nice dynamic stability at the speed and was launching off the crests, landing smoothly keeping up to speed and taking on the next one. Driving straight into the large swell, there was no water coming over the deck and only minor spray could be noticed at the bows as we were riding down the waves.” Of course, with the Leopard 51 PC being delivered from Cape Town to world-wide destinations on its own bottom, she is entirely capable of handling these conditions. She also incorporates a brilliant ergonomic layout that makes maneuvering around the power yacht comfortable and easy. The Leopard 51 PC can be driven from the flybridge or from inside (optional). Like the other award-winning catamarans of the Leopard fleet, the 51 PC includes a large flybridge with seating for up to 8. She also features a large forward cockpit, something first seen on the award-winning Leopard 44, and a sunbathing platform with direct access to the flybridge, a first for Leopard Catamarans. The Leopard 51 PC also includes a completely redesigned interior, featuring new materials used for flooring and cabinetry creating a fresh modern look. This is the first Leopard model that will use the new interior layout. 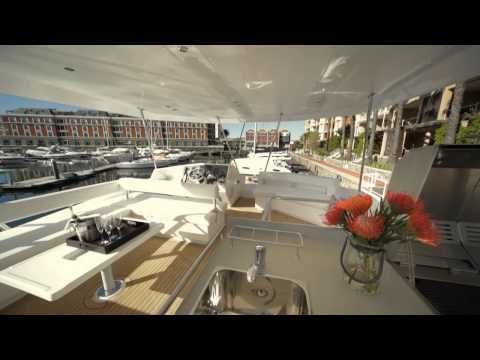 She also boasts a large and open saloon, a galley with the latest appliances. The Leopard 51 PC combines the best from their sailing fleet with the luxury and ease of a power yacht. To add to all of this, with such a large amount of square footage, this catamaran boasts an exceptional value. Unlike traditional monohull powerboats, catamarans offer additional space both inside and out, and more stability. Robertson and Caine design and build the Leopard line of blue water cruising catamarans. As the world wide dealer, Leopard Catamarans is proud to say that over 1,000 Leopard cats have now sailed more than 9 million miles and the world’s largest oceans.